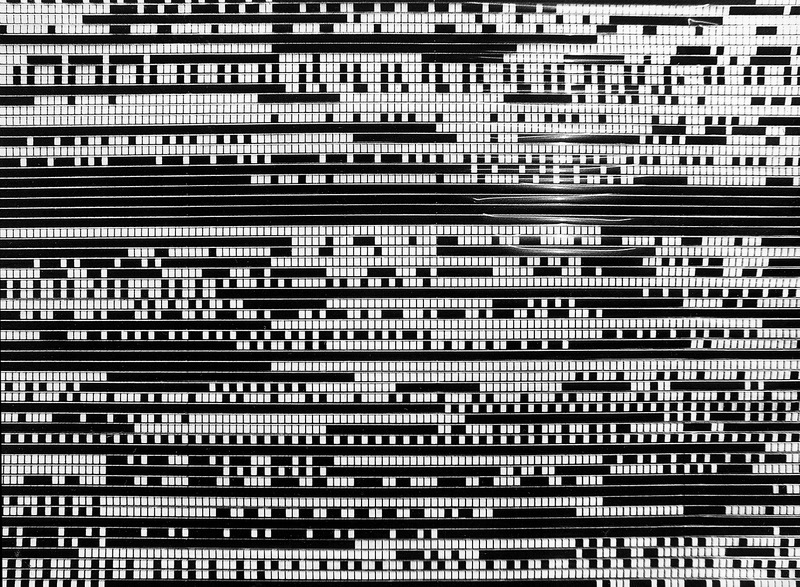 In the creation of the sound film named after the Viennese artist Arnulf Rainer, Peter Kubelka used four strips of different material: blank film, black film, perforated magnetic tape with recorded white noise, and blank perforated magnetic tape. Thus, the film consists of the four different elements of light, darkness, noise, and silence, and these are audiovisual correspondences, given that white noise, like white light, contains all of the frequency components of the spectrum with a constantly even amplitude. Like the motion picture, the film’s sound exists in its two extremes. Presence and absence in stroboscopic alternation substitute for the representational function of the film and transform it into an event. In the process, the illusion of cinematographic motion is made visible: the interpolation of the eye between the flashing frames as a condition for the fusion of the individual images into a continuous movement. This physiological sensory process usually goes unnoticed, but given contrastive alternating stimuli is now experienced in the form of afterimages on the retina. However, with this irritation, by means of which the visual perceptive apparatus is cast back into its own physiology, Kubelka is not merely formulating a critique of the apparently self-evident conditionlessness of the unhindered gaze, but is at the same time demonstrating his emphatic notion of film as rhythm. Here, film becomes a metric art form, for the projection speed of twenty-four images per second sets the primary pulse and is thus the underlying meter for the interdependence of sound and image. It is above all in the form of varying relations in synchronicity that the principle of metric film becomes evident, as the score for the light and sound events in Arnulf Rainer demonstrates. The image and film frames are complementary, virtually counterpunctually contrasted in microstructural motifs, from which varying macrostructures can be derived. This evidences a conceptual propinquity to the musical principle of developing variation—sound and image are structured audiovisually as two voices. Arnulf Rainer is thus less a transfer of certain formal elements of music into the fine arts in the sense of a formation of structural analogy and more a structural identity of sound and image that in this form can only be demonstrated in the medium of sound film. It is worth noting as an aside that this white noise is a theoretical model whereas in media-engineering practice noise is always filtered through the spectral envelope of non-linear frequency responses of synthesis, recording, and playback devices. Cf. also Diedrich Diederichsen “Kritik des Auges—Auge der Kritik,” in The Expanded Eye: Sehen—entgrenzt und verflüssigt, ed. Bice Curiger, Kunsthaus Zürich exhibition catalog (Ostfildern: Hatje Cantz, 2006), 65–74, here 70ff.